Get all the weaving yarn as well as project instructions to weave these striped twill and basketweave towels! With this kit you will get the project instructions as well as all the yarn to weave four unique striped towels in basketweave and twill. Although the color order of the stripes in these towels looks quite complex—it even appears random—it follows a clever plan. Each stripe of color is a module consisting of 21 warp threads divided by 4 warp threads of another color; 14 warp threads in the main color are on one side of the 4-thread divider, 7 on the other side. In each stripe, the 4-thread divider is the same color as the main color in an adjacent stripe. 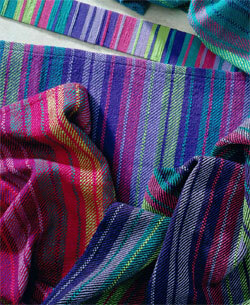 In the towels, the 4-thread divider weaves basketweave to contrast with the 2/2 twill produced by the main colors. These handmade towels will add unique details to your home or make the perfect gift. These towels were designed by Betsy Morton and come from Handwoven magazine’s popular project eBook, Best of Handwoven: Yarn Series—A Dozen Projects in 8/2 Cotton. Included in this kit are the instructions for the Designing Stripes for Towels (full eBook is not included). These towels can be woven on a 4-shaft floor loom and the width in the reed is 24 inches. Finished dimensions of one hemmed towel are 20 1/2 inches by 31 inches.